A co-founder of Alembic Inc. and a maker of instruments for such artists as Lindsey Buckingham and the Grateful Dead, Rick Turner is also a collector of Howe-Orme guitars. In this interview he explains how these rare but undervalued instruments have been overlooked in the guitar collectors market, and sheds some light on the Elias Howe Company’s largely unknown history. Turner can be contacted via Rick Turner Guitar Company. The Howe-Orme Style 6 from the turn of the 19th and 20th centuries had a Brazilian rosewood back and an abalone fingerboard. I first started coming across Howe-Orme instruments when I was an apprentice guitar repairman in Boston in 1963. Their guitars have a tilting neck and a uniquely arched top that is bent in a cylindrical direction. The middle third of the top is raised and is bent in an arch. They sound incredible. They’re one of those weird branches of the guitar tree that just died off in the teens. Elias Howe started the company that wound up making and distributing the guitars. There were two men named Elias Howe: One invented the sewing machine, and the other helped establish the music-publishing business in America. They were born a year apart before the Civil War. The Howe who interests me was a virtuoso fiddler. I think he was born in 1829. In the 1840s he had tired of purchasing sheet music one song at a time and wondered why there couldn’t be a collection of popular fiddle tunes published in a book. He took the idea to a printer in Boston who thought it was such a good idea that he fronted the cost of the plates and printing up an edition. Howe was 21 years old at that point. He had major success selling these books door to door. He then wrote and published the first “Teach Yourself to Play Violin” book and the first accordion method published in the U.S. He went on to establish a very successful music publishing business, which he ultimately sold to the Oliver Ditson Company. He had signed a non-compete agreement with Ditson, but came back into the publishing business after the Civil War. Around the 1870s, he founded a publishing house in Boston and also started to distribute musical products. I have a copy of the company’s catalog from about 1897. It looks like a cross between a regular wholesale music business and a complete lutherie supply business. They sold all kinds of parts to make violins, as well as tools and banjo heads. They had complete lines of instruments, which were known as the Howe-Ormes. Orme was a Canadian. A guy named James Back seems to have designed the instruments for him. Some have the Orme brand name, and some are Howe-Ormes. The Orme instruments we’re likely made in Boston, though some may have been made in Ottawa. 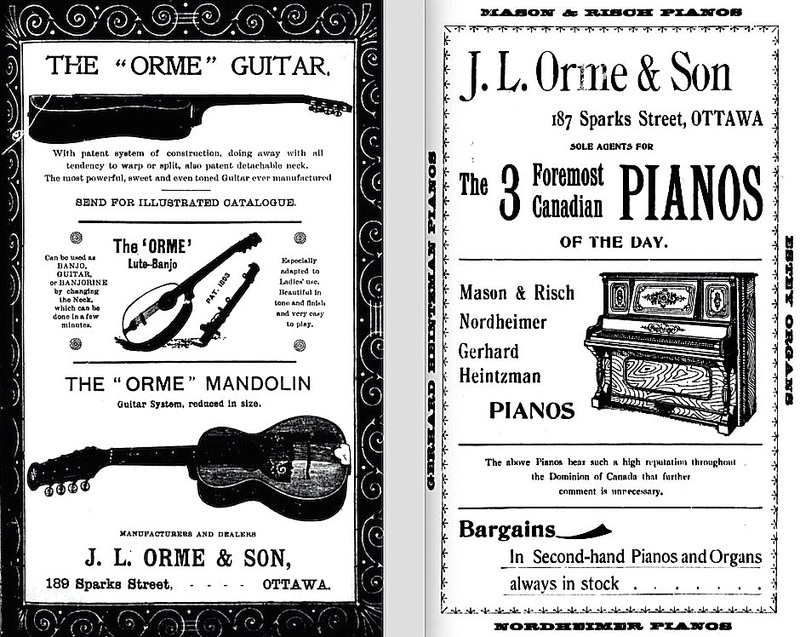 The Orme-branded ones were distributed in Canada, and the Howe-Ormes were distributed in the U.S. They made a complete family of mandolin-style instruments with guitar shapes. They look like little ukuleles in a way. They made what are now known as mandolinettos, a short-scale, soprano ukulele-sized mandolin with eight metal strings. The next sizes up were their tenor mandola, an octave mandola, and a cello mandola. Oddly, the scale lengths on these instruments don’t track at all with the Gibson scale lengths, but I believe Howe-Orme was making the family of mandolins before Gibson did. Howe-Orme also promoted the mandolin orchestra idea before Gibson. They’re exquisitely made and of equal quality to the instruments made by the Martin Company in Nazareth, Pennsylvania. That’s unusual for the time period. Most other instruments made at about that time, even most of the Washburns, were not up to Martin standards. Martin was clearly at the top of the heap in terms of how they’re built, but the Howe-Ormes are just as good in terms of craftsmanship and aesthetics. They’re gorgeous instruments. Collectors Weekly: How many Howe-Ormes do you have in your collection, and what made you want to collect them? Turner: At one point, I had 15 of them. I sold a matched quartet of Howe-Ormes to the Musical Instrument Museum in Phoenix. They were sort of the equivalent to the 28 series Martins in their appointments. It was probably the only complete matched set quartet in existence. My friend Lowell Levinger, whom I’ve known since 1963, probably has more of them than I do now. I have seven or eight, most of which need extensive work. They’re sort of retirement projects for me. This circa 1897 Howe-Orme cello mandola has a mahogany body and a bound top. My initial idea was to find and collect a brand that was beautiful, unusual, and virtually unknown. I was able to get most of them for far less than it would cost me to make them. Anytime I can buy a nice vintage instrument for less than I’d have to charge to make a replica, it’s a bargain. So these things were really bargains. More people know about them now, thanks to the Internet, but when I started collecting them I had to go to the Boston Historical Society to do my research. I found a book published in the early 1890s that was basically filled with bios of prominent Boston businesspeople. Elias Howe was in there. Two of his sons took over the business and moved it. The Howe catalog I mentioned is from that time period. Howe was one of the first vintage instrument collectors in the U.S. In the 1880s he’d make yearly trips to Europe, buy instruments by the dozens and bring them back to Boston. He had a team of luthiers who would restore them, and then he’d sell them. One of the instruments in his collection was a Stradivarius violin. Several years ago, a Russian guy got in touch with me and asked if I knew anything about the whereabouts of a violin formerly owned by Elias Howe. Of course, Howe died a hundred years before this guy was asking me about this. He thought the Howe violin might have been the first signed Stradivarius and was one of the very few remaining in original condition. That violin may have disappeared, so it’s very interesting. Anyway, I’m not interested in willy-nilly collecting. I sort of derisively refer to Les Paul and Stratocaster collectors as Ford and Chevy collectors. They’re nice instruments, but they’re just cranked out from an American factory system. They just don’t interest me, except as decent-playing guitars. I have a fair number of instruments, many of which are also retirement projects, like a 1929 or ’30 Martin soprano ukulele. I’ve got what will be a nice 1919 Martin 00-18 that somebody did a horrendous bridge repair on. I’ve sold a number of similar instruments over the last few years. I also had an amazing Indian rudra veena, which is the predecessor to the sitar. Very few are being made anymore in India for a variety of reasons. But the Howe-Orme thing is what really interested me. Collectors Weekly: What kept Howe-Orme from becoming as successful as Gibson? Turner: I don’t know. In family businesses, sometimes the heirs don’t have the same passion or smarts as the founders. In the early 1900s, the Howe-Orme instruments, the mandolin instruments, were much more like parlor or chamber-type instruments than orchestral or concert instruments. They had a very sweet sound, not the kind of in-your-face sound of the Gibson archtops—a little more classical perhaps. The Gibson stuff was louder. Howe-Orme guitars, such as this 2535 model, are rarer than other types of Howe-Orme instruments. Also, the guys who took over Gibson in 1906 showed a brilliant marketing strategy in their promotion of the mandolin orchestra and in getting music teachers set up as dealers. There’s kind of a parallel to “The Music Man.” You wonder if it was a scam. Whatever it was, Gibson really got off the ground through their promotion of local mandolin orchestras and instruction. I’m not sure why it didn’t work for the Elias Howe Company. The line just seems to have died out. No one on the small Howe-Orme scene has been able to find an instrument with an original receipt yet. We’ve got patent dates, and we know that several thousand were made because of the higher serial numbers. Where’d they all go? I bet there are still a bunch of them in attics. They’re beautiful enough that people wouldn’t be likely to dismiss them as a piece of junk. It’s not like all those plastic ukuleles. In his career, Mario Maccaferri made more than a million plastic Islander ukuleles. Where are they now? I see them in collections and so on, but probably 900,000 of them wound up in landfills. As far as the Howe-Orme stuff, the company seems to have died out in the late teens or maybe in the ’20s. It’s possible that they made it all the way up to the 1929 crash and then faded out. I talked to a Boston postman who was at the Historical Society on the same day that I was there. He remembered seeing the faded Elias-Howe name on a brick wall of a building. So I just don’t know. I haven’t been able to take my historical research any further. Bob DeVellis and Gregg Miner wrote a scholarly article on the Howe-Ormes. It was reprinted from “The Fretboard Journal” and used as part of a catalog for the exhibit by the Museum of Making Music. They, Lowell Levinger, and myself figure that there weren’t any made past about 1915. The company may have stopped production before 1910. There are interesting similarities between Howe-Orme instruments and some Vega instruments. The Vega guitars had a cylinder top and back. They made some beautiful cylinder-backed mandolins. Some of the inlays are similar. I suspect that some of the people who worked for Elias Howe wound up working for Vega. We do know there was a group of luthiers in the Boston area at that time. A number of them worked for several of the companies. Chickering pianos and Mason & Hamlin pianos were there, too. Before Chicago came on strong, Boston was the center of musical-instrument manufacturing in the U.S. It was more important than New York. Then Chicago started taking over in the early 1900s. They remained strong up into the early ’70s when Japanese guitars started turning up in the U.S. You still had Harmony cranking stuff out in Chicago at that point. That’s another one: Where did all the Harmonys go? They made tens of thousands of guitars. Sovereign flattops are top-of-the-line guitars. They were pretty decent instruments for well under a hundred bucks. I’d think you’d see more of those today. Howe-Orme instruments are beautiful, they sound good, and yet they ultimately weren’t commercially successful. Martin and Gibson made it, and in its own way so did Vega by specializing in banjos. But the Howe stuff just faded away. Collectors Weekly: You just found these guitars randomly and started picking them up? Turner: Yes. I started collecting them probably in the early 1970s. I put the word out, and they just started finding me. At that point, I was about the only person interested in them. I came across them one at a time. Then I got a couple from one guitar repairman in Boston, and another one from the Music Emporium that was in Cambridge in those days. I found one in a store in Vermont. A beautiful guitar found me in Southern California. I just snatched them up here and there for pennies on the dollar of their worth. This Howe-Orme cello mandola, #294, is from around 1891. I think things like the Vivi-Tone, which was made by Lloyd Loar, should be valuable because of their inherent quality or because of their inherent historical importance, but they aren’t. Loar was arguably one of the pioneers of the electric guitar. 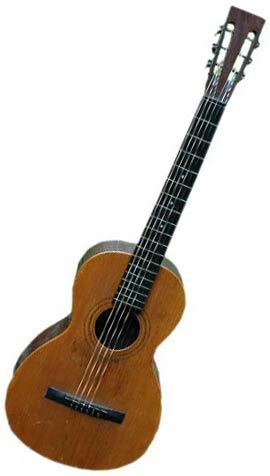 I’ve got a 1933 Vivi-Tone acoustic-electric Spanish-Hawaiian convertible guitar that was Loar’s personal instrument. Loar produced a complete family of electric instruments. He did an electric violin, electric bass, and electric piano. He did a solid-body electric guitar way before Les Paul. His pickup technology turned out not to be very successful, but he was a real pioneer. Musical instrument and guitar collecting is a fairly unsophisticated market. It’s really fad-driven. It’s all Stratocaster and Les Paul stuff. It’s not like the antiques market where the quality of the objects tends to drive the prices rather than just name recognition. Rarity and quality don’t account for very much in the guitar market because people are just so brand-conscious. The brands they know, with some exceptions, are the factory brands: Martin, Gibson, Fender, Gretsch, and so on. In America, of course, guitars were always more of a factory thing. It’s not like the violin world where factory violins were never regarded highly. There are other amazing guitar makers. Philip Interdonati made outstanding instruments, but nobody knows about him. He probably made fewer than 50 in his life. To me, those should be worth at least as much as your collectible Martin 000-28s and OMs, but it’s not that way because the steel-stringed guitar in America is a factory phenomenon. Yes, you had the Larson Brothers, the Strombergs in Boston, and D’Angelico, but by and large, it’s the big names. The Howe-Orme guitars, for instance, should be worth as least as much as the equivalent Martins and they’re not, but I think they are even better guitars in many ways. Not to put down the Martins at all, but the Howe-Ormes are incredible. Nobody knows about them, though, so they’re not particularly valuable. Collectors Weekly: Do you know any other Howe-Orme collectors? Turner: Yes, Lowell Levinger, who I mentioned. He and I have the two largest collections. At one point, I think we collectively had about 25 of them. He still has quite a few of them. He also has one of the largest collections of tenor guitars, four-string and some five-string tenor guitars. He’s a vintage-instrument dealer. His thing is what he calls “Players Vintage Instruments,” which are not necessarily the highly collectible, pristine, never-been-touched things, but ones that have been played and loved and sound great. I don’t really know anyone else who has multiple Howe-Orme instruments. Maybe Gregg Miner’s got a couple. Bob DeVellis may have more than one by now. Marc Silber of Marc Silber Music in Berkeley may have a couple of them. He was trying to collect at least one piece from every maker who had built a guitar before 1960 in America. At one point he had 60 builders represented in his collection. That’s another thing, having a focus to your collection. My point with the Howe-Ormes was to have one of every model they made. The matched quartet was the center of the collection. It’s collecting with a real goal as opposed to just grabbing something because it’s valuable and may become more valuable in the future. A real collection has a story to tell. Collectors Weekly: Were there other small companies like Howe-Orme? 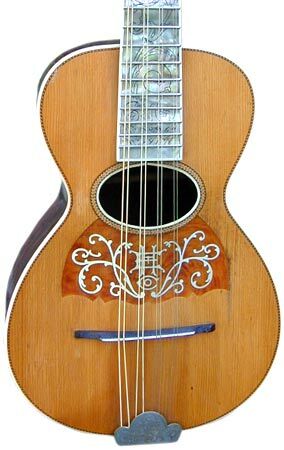 In 1891, Howe-Orme also made a tenor mandola. Turner: Yes. The Larson Brothers made instruments under a variety of brands, also Hermann Weissenborn. Chris Knutsen made all kinds of weird harp instruments. He licensed the Dyer Harp guitar design to the Larson Brothers, who then made them. He started off Port Townsend, Washington, moved to the Seattle-Tacoma area, and then wound up in L.A. As far as anyone knows, he never made any two instruments the same. We did a harp guitar exhibit at a museum a couple of years ago—Knutsen stuff and earlier instruments. Gregg Miner is a harp guitar fanatic. So we had a lot of his Knutsen collection and other things in the show. That ties in with the whole explosion of Hawaiian music and the hollow-necked lap instruments, which Knutsen started building and then Weissenborn took over. Rudy Dopyera later worked for Weissenborn. When he went to make the metal tricone instruments, they were shaped almost exactly like a Weissenborn. It’s a metal knockoff of a Weissenborn with three cones of aluminum instead of koa wood. Knutsen is collectible. Weissenborn is very collectible. There are other odd ones. Lowell Levinger collects Tieri mandolins. Tieri was a mentor to John D’Angelico. There are a bunch of regional makers who clearly got tooled up to make a lot of stuff, but who didn’t see wide distribution. The Howe company also knew what it was doing. 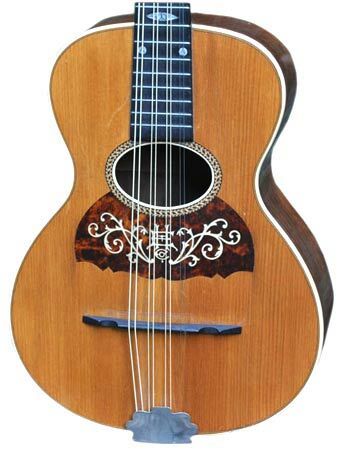 They came out with these really unusual designs, particularly with the guitar-shaped mandolin family and then the tilt-neck guitar with the cylindrically arched top. They made particular models in a regular, though limited, production. The design features had been patented. These were very carefully thought out instruments. I have a small Howe guitar that has two patented, extra resonating tops inside it. It looks to be hastily built as though it were the prototype. It’s the only one of these that anyone has ever seen. The back is off of it right now. It needs a complete restoration job. It has numerous cracks and glued seams coming undone. I’m going to document the restoration process on it. Collectors Weekly: Was there any relationship between the archtop Gibsons and that mandolin? The size of this circa 1898 Howe-Orme instrument is similar to a ukulele, but it’s really a guitar. Turner: I don’t think so. I think it was affected by violin arch construction, giving it a strength that’s really interesting. There was a fair amount of experimentation going on in those days. I don’t think there was much of a connection between Gibson and the Howe-Orme stuff. They were contemporaries. I think the Howe-Orme stuff was developed without knowledge of what was going on at Gibson. Patent dates are 1893 and 1894, and that’s about when Orville Gibson was starting to make his stuff in Kalamazoo. You have to understand that in the 1800s everybody made music at home in America. Sheet music was incredibly popular. Every middle-class home had a piano or a pump organ. An ancestor of mine was the Hamlin of Mason & Hamlin pianos. That was an important company. Until the phonograph came along, you had music boxes and people made their own music. It was not such a performer-consumer oriented thing. They had performers and concert artists and all that, but it was very much about participation. People mostly played light classical and a lot of Stephen Foster. You also had the popular fiddle tunes that came over from Ireland and Scotland, which are still in the folk repertoire. Ragtime came a little later. There was also minstrel-show music. People went to the theater, and it was the beginnings of Vaudeville and variety shows. It must have been fun. As far as I know, there weren’t any well-known artists who used Howe-Orme instruments. They have rarely been recorded. Henry Kaiser may have done some recent recordings on a Howe-Orme guitar, but I don’t know of any early examples. Collectors Weekly: Were Howe-Orme guitars the first to have a removable neck? Turner: No. That was done as early as 1823 or so. Johann Stauffer in Vienna, who taught Christian Frederick Martin to build guitars, made the skate key or clot key adjustable necks. Martin built some that way in the 1830s. Shertzer, another builder who studied with Stauffer and was also in Austria, made some harp guitars with adjustable necks. Then the Zimmerman Company made copies of the Shertzers. There’s a whole Russian seven-string guitar tradition. It’s a classical tradition that has nothing to do with the Spanish classical tradition and using seven-string guitars. Orme and Howe-Orme made some of those with tilting necks in the 1890s. I’ve seen a Larson Brothers design patent for a guitar with a tilting neck, though I’ve never seen the guitar. 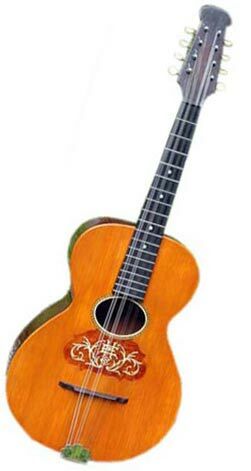 Some of the Kay Craft guitars from 1928 had a tilting neck, as did some Paramount guitars from maybe the 1930s or ’40s. When I build acoustic guitars, I build them with tilting necks and a cantilevered fingerboard that doesn’t touch the top. I think it makes for a fantastic-sounding instrument. The action is incredibly easy; it’s just amazing. She also has a Legion acoustic guitar that was made in the USA, and wants to know its history and value. The Teiscos have become a kind of bargain basement collectible. 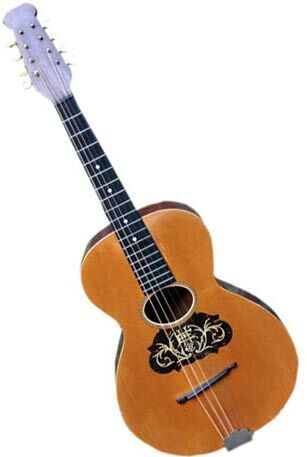 Musicians like David Lindley, Ry Cooder, Buddy Miller, and Henry Kaiser all have one or more, but the value is not high…you’d be looking at “retail” prices being in the $150.00 to maybe $650.00 range. Ry has a Teisco pickup on his “Franken-Strat” guitar that he uses for a lot of his electric slide work. I don’t know the Legion brand at all. Is it vintage? Contemporary? Bear in mind that there were dozens and dozens of brands of guitars that came out of a very few factories in the Chicago area in the 20th Century, and that tradition of subcontracting brands out to factories has proliferated in Asia starting with Japan and then expanding to Korea, Indonesia, and Vietnam now. We’re talking hundreds of brands made by dozens of factories, with one brand often coming out of multiple factories. There’s someone selling a Legion acoustic guitar here in Kansas City that looks a lot like a Stella — maybe a spinoff. I can’t find any information on who made it, where or when, but I’m considering buying it if the price is right. I own a Barclay, which is made in the USA and is also a close cousin to a Stella. Anyone know any more about the Legion? I have my uncles HOWE-ORME, 8 string ukulele. The label shows a faded numberG?B7? and to the right of the label is the year 1894 in small print. I believe I have a 1897 Howe Arme cello mondola. It looks like your second picture in this article. Can you tell me it’s value. Inside it says Pat August 24, 1897. It has the original case, the instrument is in mint condition. Thought you might be interested in this. It’s an 1895 ad from the Ottawa Journal for the “Orme Guitar”, Lute-Banjo, and Mandolin – with patented interchangeable neck. I HAVE HAD A HOWE-ORME #2373 18FEB94 FOR A LITTLE OVER 50 YEARS. IT IS A LARGE SIZE, IN FAIR TO GOOD CONDITION–SOME CRAKES ON THE BACK AND TWO ON SIDE, AND AN AFTER MARKET BRIDGE WHICH IS NOW COMING OFF. THE NECK IS IN EXCELLENT CONDITION. BEFORE THE LIFTING BRIDIGE I PLAYED IT FOR PERSONAL USE–IT SOUNDS GREAT! EVEN WITH THE NYLON STRINGS I USED. CAN YOU TELL ME ABOUT THE #2373 MODEL IS IT ABOUT THE SAME AS THE #2423? “ ” Every brick is different because each comes out of a different hole in the ground.